Share This Post: Is Your Sales Process Too Complex for Marketing Automation? “Marketing Automation” is (and has been for a while) a white hot buzzword in the marketing community. The attraction is easy to see. With limited team resources and budgets, the ability to streamline processes and leverage technology to do the heavy lifting can be a huge weight off of the shoulders of marketing. But is marketing automation for everyone? I would argue that while some businesses may have a harder time implementing this or struggle to go “fully automated”, there are elements in EVERY sales and marketing process that can benefit from marketing automation tools. For companies with short buying cycles with relatively straightforward products, it’s pretty easy to think through a logical sequence of email messaging to trigger when a lead is generated. In this environment, it’s somewhat of a numbers game – get in front of enough people, send them your tried and true messaging, and you’ll start to see results. * Day 1 AM- Hey there, welcome to Wistia! * Day 1 PM – Want to schedule a quick call with Wistia? * Day 7 – Curious how Wistia stacks up against the competition? * Day 11 – You only have 3 days left in your trial! * Day 14 – Your unlimited free trial ends today. What’s next? This is awesome. It kept information about the product in front of me and suggested new ways to make the most of my free trial. I didn’t buy the paid version just yet, but intend to in the near future. Wistia is knocking it out of the park with their email nurturing, so kudos to them – however, many of our businesses are less cut and dry than the example provided. The sales process is rarely linear in a big dollar or considered purchase, and you’re likely to have many buyers at the bargaining table. The CEB estimates it’s 5.4 on average in B2B sales. For example, you might be in a services industry where a lot of your sales process involves tailoring your approach to that customer and finding a unique way to break through the clutter prospects are subjected to on a daily basis. B2B and complex sales are a practice where art, science, and craft meet. In this kind of environment, textbook applications of “marketing automation” best practices can be difficult to scale. Just think… if you wanted to tailor your messaging to the 5 individuals typically involved in purchasing your product, in 7 main industries you serve, and touch the prospect at least once during 5 steps in a buying cycle – we’re talking about a minimum of 175 unique pieces of content to write, edit, optimize for search, layout, design, A/B test, and report on. Even for robust teams, the sheer quantity of that feels hard to swallow. But an even bigger challenge is just defining steps in the sales process to begin with. Most organizations struggle with this big time (which presents its own set of issues). Without clarity on the sales process, marketers are left trying to automate a flawed system or find the lowest common denominator between diverse approaches of individual reps. I think some sales and marketing professionals get hung up on the term marketing automation when it’s implied that the process needs to be “fully automated” with a sequence of pre-packaged and timed communications that eliminate the need for any labor. If that’s something you’ve been able to achieve, great – but if that seems daunting or near impossible, you can still use marketing automation platforms to streamline your process in a number of other ways. 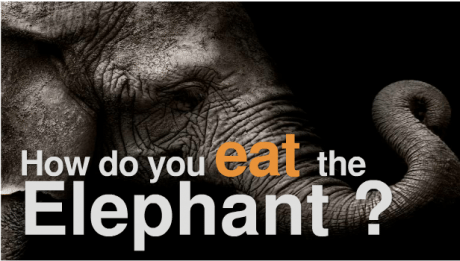 How Do you Eat the Marketing Automation Elephant? Even in the most complex sales, there’s likely something in the marketing automation toolkit that would help find efficiencies for you and your team. Sure, part of sales will always be an art – but start with the parts that AREN’T and automate those so that your team can focus more time on what they do best. Don’t feel daunted by the scope of all the things that “could be,” and take on marketing automation one process at a time. If you’ve launched a marketing automation program or have dabbled in it – what lessons learned would you share with those considering taking the plunge? What have you successfully automated? Where are you struggling? Let us know if the comments!